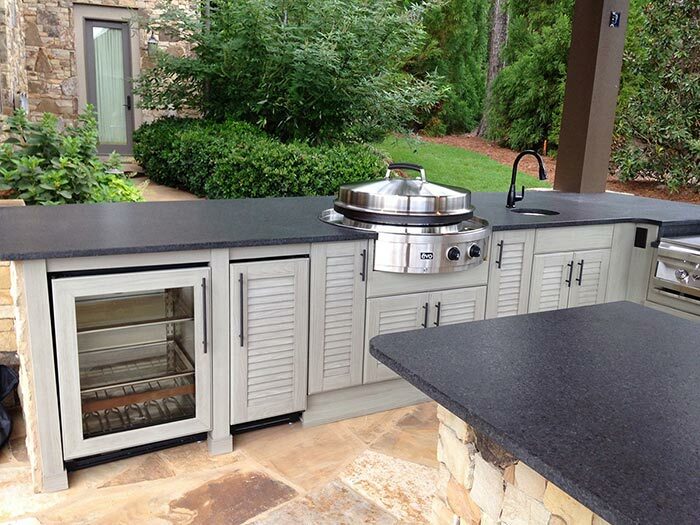 Dye reports his company is also putting a lot of sinks in outdoor kitchens as well as pizza ovens, ice makers, refrigerator drawers, and other features. 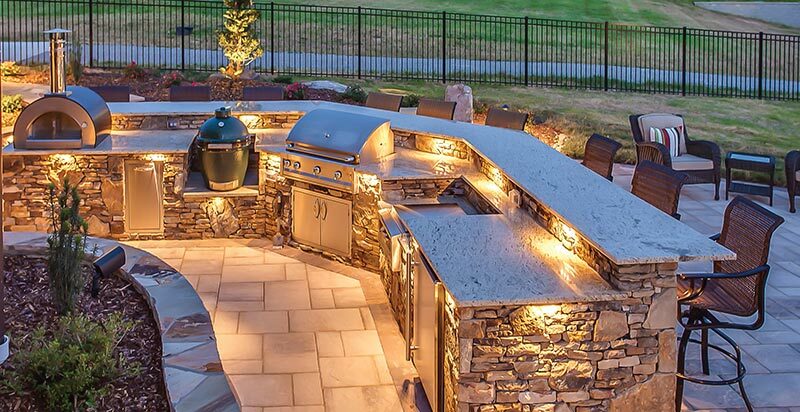 “Great outdoor lighting is a must! LED lighting provides one of the best ways to extend the comforts of your indoor space to the outside areas of your home. Emitting less heat than florescent bulbs, LED lighting attracts significantly fewer bugs. Sullivan says that, depending on a client’s budget, some may purchase a Grill Island by Peterson, The FireMagic Grills series. These grills come with the grill, side burners, and countertops manufactured as one unit. They can take this grill with them if they decide to relocate—it is a very large portable grill available in natural gas or propane. “We also offer FireMagic Grills including everything from the sink, refrigerator, side burners, bun warmers, and of course you have to add a smoker by The Big Green Egg. Not all customers are adding pizza ovens. But most are adding the Big Green Egg since it can be a smoker, baker, and cooks a delicious pizza,” Sullivan says. Beth Duer of Markraft Cabinets reports she is seeing a lot more activities taking place outdoors,” and entertaining outdoors means the hostess/host gets to be a part of the party rather than running in and out to the indoor kitchen. Durability in outdoor kitchens is a concern, says Duer, and Markraft carries NatureKast weatherproof cabinetry which is designed to withstand the natural elements. “In recent years our outdoor projects have grown in size, style, scope, and budget, with costs these days mimicking those of an indoor kitchen,” she says. Original article from Greater Nashville House & Home Magazine.